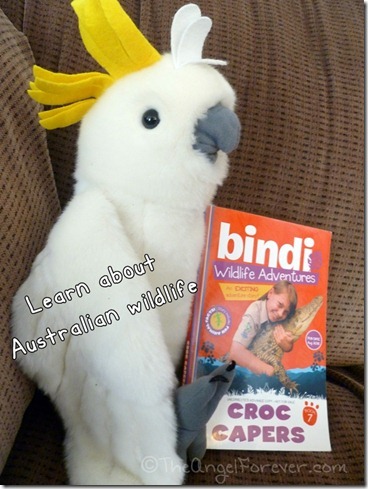 Several weeks ago on Tuesday Tales, I reviewed the book Croc Capers by Bindi Irwin. Bindi is the daughter of the late Steve Irwin (aka – The Crocodile Hunter). Over the years, Bindi has had her own television show (Bindi: The Jungle Girl), clothing line, and is also an author of a series of wildlife adventures. These adventures feature Bindi and her family in Australia where she has to solve a problem. After reading Croc Capers, my youngest is now interested in reading the rest of the series. Thanks to Sourcebooks Jabberwocky, one lucky reader will have the chance to win books 1-7 of the Bindi Wildlife Adventures series. This time around, I am trying Rafflecopter to see how it goes. Please be sure to see the rules listed. To enter, please follow the rules above within the comment section and Rafflecopter. Giveaway begins September 9, 2012 and ends September 24, 2012 at 12:01 am EST. You do not have to be a blogger to enter, but must leave a valid e-mail address for me to contact you for mailing address once the giveaway is over. You will have 48 hours to claim the prize. If there is no response, another winner will be selected. Open to US and Canada residents only. Disclosure: I received Croc Capers complimentary of Sourcebooks in order to facilitate a previous review. This giveaway is sponsored by Sourcebooks who will fulfill the prize package to the giveaway winner. I think she should write about the Pangolin because it is such a weird creature! I would like Bindi to write about Elephants because they are very smart and social and I would like children to learn more about them. I sadly don’t know many of the Australia animals outside of the Koala and Kangaroo. I’d love a book that’s an overview of all the birds native to Australia. Love Bindi! I think my boys would enjoy reading a book about the Tasmanian Devil. How about a penguin~that isn’t the typical place you think of penguins living. My kids like sea turtles, so they’d enjoy a book about them.